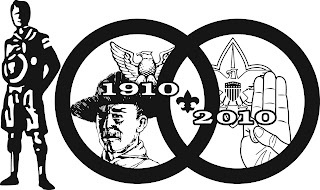 Exactly one hundred years ago last month, Chicago publisher W. D. Boyce incorporated the Boy Scouts of America, several months after being helped on a foggy London street by a boy who refused a tip, explaining that he was simply a Boy Scout doing his daily good turn. Much has changed over the past century, but much has not. I've mentioned before that even if I wanted to get back into Scouts as a leader I couldn't, not without being dishonest with them and with myself. See, I'm an atheist, and the Godless are one of the three "G"s not allowed into the Boy Scouts, along with Girls and Gays. I was only just starting to figure this out in high school, after I was well into Scouts (and had earned the Methodist religious award). Even though I've only started calling myself an atheist within the last few years, at the time I was definitely at least an agnostic, and became pretty uncomfortable with the religious aspects. I kept my mouth shut, though, because I loved Scouts, and wanted to see it through to my Eagle. If you notice, the page linked there to the BSA National Council's legal issues website has much, much more in the way of official policies to back up their position regarding non-theists than the corresponding page regarding homosexuality, which is, shall we say, sparse. So, fine. At least they're upfront and consistent about the God thing. The thing that I find really puzzling and infuriating, though, is that the BSA really has made a specific effort from the beginning to be religiously inclusive. "Your family and religious leaders teach you about God and the ways you can serve. You can do your duty to God by following the wisdom of those teachings and by defending the rights of others to practice their own beliefs." The exhortation to defend and respect the beliefs of others, even if they are different from yours, is echoed in the explanations for the "morally straight" part of the Scout Oath and the"friendly" and "reverent" points of the Scout Law. They specifically want Scouts to be exposed to different religious points of view, and one of the key values is to respect them, to not exclude or oppress them, to defend their right to believe as they see fit. A quick scan of the official religious awards that Scouting offers gives a small cross-section of the faiths that the Scouts recognize. We see a bunch of Christian sects, natch, but also Judaism, Islam, Buddhism (who, it must be noted, do not have a "higher power" that they report to), Baha'i, Hinduism, Meher Baba, and Zoroastrianism. (There used to be one for Unitarians, but apparently the BSA got miffed when the requirements included criticizing the BSA's policies on homosexuals and non-theists, which is awesome.) A brief bit of research shows that they officially accept Wiccans (though individual troops may not be aware of this) and Native American faiths (it would be weird if they didn't, what with having the Indian Lore merit badge and all). I even remember a news article (found it!) in which a Council executive in the process of kicking an atheist Eagle Scout out said "Mother Nature would be acceptable." He simply had to acknowledge some form of higher spiritual or religious power. 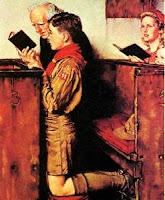 The Boy Scouts of America does not define God for a Scout, nor does it interpret God's rules. Those are matters, as said above, left to home and to the religious body to which the Scout belongs. The board of review does not serve as an inquisition into the correctness of a Scout's perceptions, rather it seeks to determine whether the Scout has fulfilled his duty in a way he sees fit, keeping in mind his profession of a particular faith.... A blunt "Do you believe in God?" should be avoided as there are some religions that do not use the name "God" for their supreme being or higher power.... A Scout may fulfill this duty without being a member of a particular denomination or religion.... It is very common for adolescent boys to question religion, particularly formal religion. If a candidate indicates that he is not certain about religion, the board should ask how he is trying address his uncertainty and to fulfill his duty to God. Sorry for the big quote, but that is some fascinating stuff right there. You don't have to be part of an organized religion, or call your higher power "God", you can question and doubt, but you still have to come down on the "higher power" side of the line. But it makes a point of saying that the Scout should "fulfill his duty in a way he sees fit." What if he sees fit to believe that the most honest thing, the most ethical and moral belief, is that there is no God, or at best an irrelevant one? What if he's determined that professing belief would conflict with every other value that the Scouts hold dear? And that's the key. They're trying to be inclusive, they are. The official policies are bending over backwards not to offend or exclude pretty much any religion you can name, as long as there is a religion. I don't think I'll ever truly understand why, for so many people, any god is preferable to no god, why they will accept people of other faiths even if those faiths completely and totally contradict their own in nearly every way long, long before they would accept people without religion. Because, of course, one cannot be truly moral without God, without the rules imposed by a higher power. It's clear to me that they want to train you to be a good person on your own, to help you learn to trust your own judgment, so you could be truly honorable. They don't want you to be just a rule-follower. Page 25, explaining "A Scout is obedient": "If he thinks these rules and laws are unfair, he seeks to have them changed in an orderly way." The Scout Oath and Law are not rules. 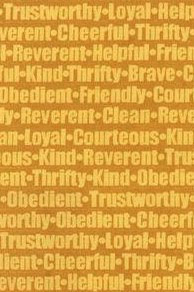 They're values, helping you make the "ethical and moral choices." The best I've seen from religion is similar: people using the religious teachings to try and help others, to make the world a better place, to decrease the pain and suffering they see all around them. That's what I try to do as well. If I succeed, I partly have the Scouts to thank for it. They helped me refine my morality, helped give me the confidence and strength to act upon it, to help if I see a need, to speak out when something is wrong. To be told now that I am not considered a good role model simply because I believe this strength comes from within us, not without, because I trust the wonderful compassionate people who have guided and helped me rather than some nebulous figure whose presence I've never felt, to know that the organization who helped shape me into the man I am today and whose values I still treasure would require me to betray those self-same values in order to join them once again is a slap in the face that leaves me confused, angry, and deeply, deeply sad. Because in the end, Scouts and religion insist that God is necessary for morality, but that simply isn't so. Atheists have simply decided that the best of morality, from religion or elsewhere, comes not from God but from us. The majority of us have carefully considered our beliefs, have taken what we've learned and seen our whole lives, to create values for ourselves that are startlingly familiar: Be honest. Don't hurt others if it can be avoided. Help others when possible. Treat people with respect. Obey the rules, but try to change them if they're unfair to yourself or others. Try to make the world a better place than you found it. Many atheists cling fiercely to morals like these, because they know that in the end, that's what lights up the darkness. Justice, compassion, love, all the good things about the human race, are there because we want, we need them to be. We're all we've got.